While SPW typically features chefs that are a little more “seasoned” we do recognize talent when we see it. 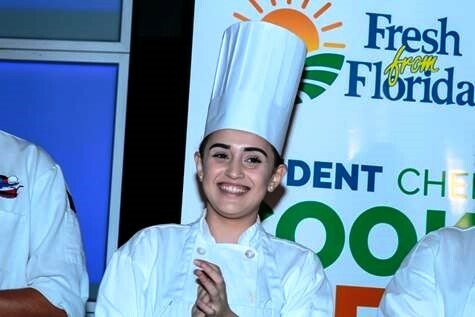 So does the Florida Department of Agriculture, which recently selected five budding chefs for a cafeteria cook-off that will brighten up lunch platters through the end of the school year – and launch at least one culinary career. The five finalists competed at regional high school competitions before advancing to the 2017 “Fresh From Florida” Student Chef Cook-Off finals last weekend. Wesley Hill of Alachua County, Katelynn Denny of Franklin County, Sheldon Riley of Indian River County, Leonard Paez of Miami-Dade County and Gianna Rivera of Hillsborough County squared off in Orlando. The rules were simple: recipes had to be original and feature at least one Florida-grown fruit or vegetable. 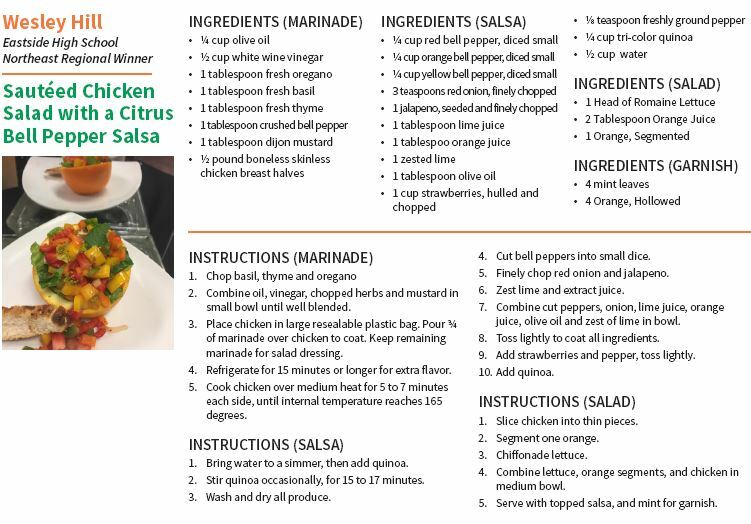 Bloomingdale High School junior Gianna Rivera’s Citrus Chicken Taco with Watermelon Salsa satisfied all those requirements and then some. The dish will be added to school menus across Florida and solidified Gianna’s hopes of becoming a chef. Gianna says she’s always been “high-maintenance” when it comes to food. The first dish she remembers making with her grandmother – and still a favorite – is beer stew. She wasn’t even old enough to buy the main ingredient – and still isn’t. Gianna takes culinary classes at Bloomingdale under the direction of Chef Rene Marquis, who formerly served as Gen. David Petraeus’ personal chef and has appeared on TV’s “Cutthroat Kitchen”. When creating her winning recipe, Gianna knew she had to focus on fresh Florida fruits and vegetables – but she also had to create a dish that kids would like. She decided to incorporate as much whole fruit as possible into the dish, zesting oranges and limes. At first she used tomato salsa as a topping – but a quick test drive with her four younger siblings gave her a better idea. Next year Gianna will get to have culinary class for two periods. After graduation, she hopes to go to the Culinary Institute of America. 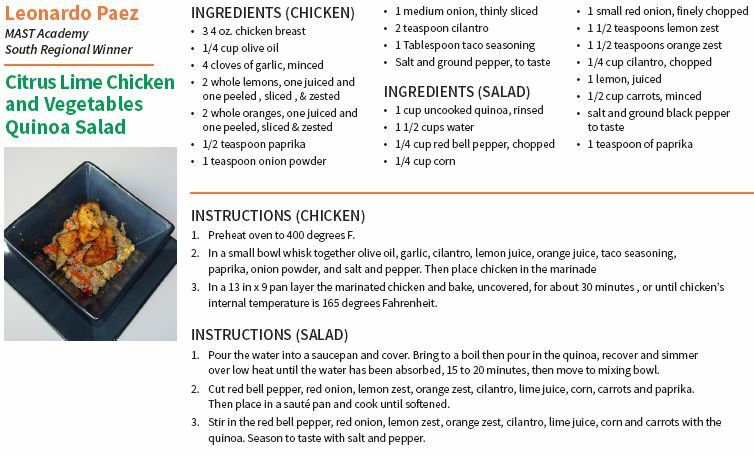 Recipes like this one will almost certainly get her in. Next articleHome-cooking: What kind of impact will ex-Georgia Gov. Sonny Perdue have on Southeast agriculture?